Solar Austin is excited to co-host the second Bluebonnet Solar Tour in partnership with the Texas Solar Energy Society and the Bluebonnet Electric Cooperative as part of the American Solar Energy Society’s National Solar Tour. The event will start at 9:00 a.m. at the Bluebonnet Eco Home in Brenham. The Eco Home was built to demonstrate energy and water efficient building techniques, as well as the use of on-site solar and wind energy, geothermal heating and cooling, and rainwater collection. There will be a short Solar 101 presentation, a tour of the Eco Home, and solar installation companies on site to provide additional information. Bluebonnet Electric Co-op representatives will explain how their process works to connect a solar installation to the grid, and how co-op members are compensated for the energy they produce. Free breakfast tacos, coffee and juice will be provided. Attendees will also be entered to win a solar backpack, which can charge your phone after a sunny walk. 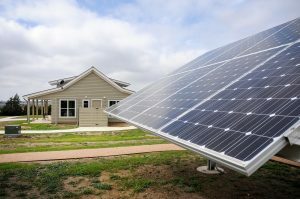 The self-guided tour of nearby homes with different types of solar setups will give attendees the opportunity to see solar in action. Homeowners, installers and Bluebonnet employees will be on hand at each home to talk about the installation process and answer questions. WHEN: Saturday, September 9, 9 a.m.
RSVP and get any last-minute updates here. And please invite any Bluebonnet Electric Co-op members you may know!